She was merging onto the cycle track, past the sensor that registers cyclists. So she didn't count in the stats, but she counts right here on Cycle Chic. This is a different counter than the one we posted a few days ago. It's on the cycle track that passes City Hall Square. You are cyclist number 5305 so far today. Out of 1,274,727 so far this year on this stretch. Quite hot in Copenhagen 27C, but she is way hotter! 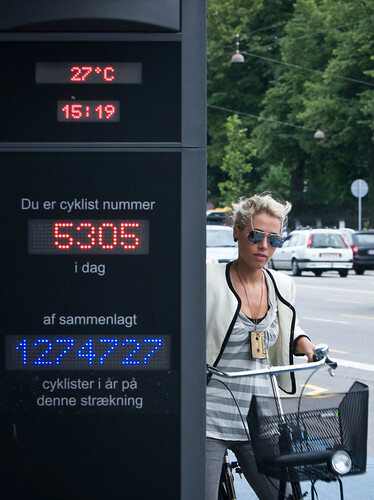 First time I see a cyclist counter. That's a nice innovation. @Daft, you could just type the number into google and ask for Miles. Possibly learning Metric might make travelling around the globe easier too, as the are only 3 countries i know of that still use metric. I do agree with anonimous, make an effort!!! 27 C or 81 F is a good summer temperature !